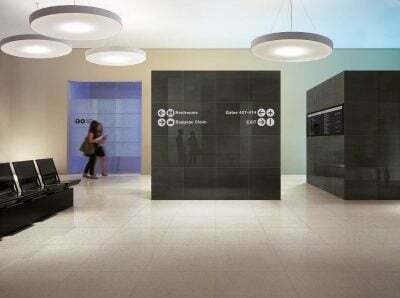 Architectural Surfaces - Floor Gres | Florim Ceramiche S.p.A. Floor Gres products are made in fine porcelain stoneware with a rational design inspired by natural colors and developed over multiple surfaces, sizes and thickness options that ensure high technical performance for applications such as industrial flooring and medium and high traffic public areas like airports, shopping centers, restaurants, offices, shops and even residential applications with targeted aesthetic content. Floor Gres porcelain tile is also suited for more complex urban decoration applications such as wellness pools and spas, rainscreen cladding and indoor and outdoor raised floors: solutions developed by Florim Solutions technical service to rise to the most complex design challenges. All Floor Gres products are ‘Made in Florim‘. The guarantee of professionalism and quality supported by the sense of passion, corporate investments in environmental sustainability and technological innovation are some of the cardinal values of an industrial group that has been on the international market for more than 50 years.